The early morning phone call came on February 4, 1969, the day after I arrived back from Tanzania to my parents' house in Tucson, Arizona. "Eduardo has been assassinated." The caller was Gail Hovey, one of the co-editors of this book. She was then working with the Southern Africa Committee in New York, a group supporting liberation movements in Mozambique and other Southern African countries. Eduardo, as he was known to hundreds of friends around the world, was Eduardo Mondlane. 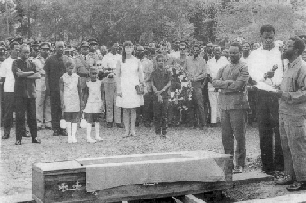 At the time of his death by a letter bomb, he was president of the Mozambique Liberation Front, known as Frelimo. Had he lived to see the freedom of his country, he would likely have joined his contemporary and friend Nelson Mandela as one of Africa's most respected leaders. It's hard to say what factors build lasting connections between people, but surely the deaths of those engaged in a common struggle must count among the most powerful. I had just said goodbye to Mondlane at the airport in Dar es Salaam, Tanzania, on New Year's Day 1969, after two years of teaching in Frelimo's secondary school. I was one of many inspired by his leadership, and his sacrifice reinforced our commitments. The deaths of Mondlane and others involved in freedom movements had profound impact not only on their own countries but around the world. The list is long: Amilcar Cabral, whose words provide our title, was killed in 1973; Patrice Lumumba in 1961; Malcolm X in 1965; Martin Luther King Jr. in 1968; Steve Biko in 1977; Ruth First in 1982; and Samora Machel in 1986--to name only a few. Memories of those who gave their lives can bind together and inspire those who carry on their legacies. So can highly visible public victories, such as the dramatic release of Nelson Mandela from prison in February 1990 and the first democratic election in South Africa in April 1994. The worldwide antiapartheid movement, which helped win those victories, was arguably the most successful transnational social movement of the last half century. All of us engaged in this book project were minor actors in that movement, and our roles will become clear as the story unfolds. In February 1969, when Hovey and I spoke of Mondlane's assassination in Tanzania, I had not yet met Charlie Cobb, also a co-editor of this book. But he and his comrades at the Center for Black Education in Washington had already made connections to liberation circles in Dar es Salaam after years of civil rights organizing in the U.S. South. Later that year he moved to Tanzania, determined to live in an African country "long enough to really learn something about it.� "What looks simple turns out to be complex,� Cobb told an interviewer in 1981, after returning to the United States to continue his career as a journalist. "If you want to write about it, as I did when I got to Africa, or if you want to organize it, which is what I did in Mississippi, then you have to learn to deal with these complexities." Dar es Salaam was indeed a gathering place in the 1960s. The city welcomed both the liberation movements of Southern Africa and veterans of the U.S. civil rights movement who looked to independent Africa for answers that were not forthcoming in the United States. Exiles from apartheid South Africa, its colony South West Africa (Namibia), white-ruled Rhodesia (Zimbabwe), and the Portuguese colonies of Angola and Mozambique all found their way to Tanzania. Liberation movement leaders regularly visited, even from distant West Africa, where Guinea-Bissau and Cape Verde remained under Portuguese rule. It was in Dar es Salaam in 1968 that I first met Prexy Nesbitt, who was still there in 1969 when Mondlane was assassinated. Over the decades Nesbitt, who has been an indispensable adviser to this book project, traveled from Chicago to Mozambique and South Africa and around the United States, making connections between African and American activists on many fronts. Nesbitt and I became involved with groups working on Africa in the mid-1960s. Even earlier, however, we felt the influence of Eduardo Mondlane and other Africans who came to the United States as students or visitors and spoke out eloquently for the freedom of their countries. Nesbitt, growing up in a progressive African American family in Chicago, had already met Mondlane at his family's Warren Avenue Congregational Church. Mondlane was exceptional in his range of contacts and his powerful presence, winning the respect of hundreds of Americans who would become involved with African liberation. In a still-segregated United States, Africans speaking of freedom for their homelands found eager listeners among those engaged in organizing for equal rights in the United States. George Houser, for example, became the first executive secretary of the Congress of Racial Equality (CORE) in Chicago in 1943 and helped organize a "freedom ride" to the South in 1947. Later he moved to New York and headed the American Committee on Africa, which was founded to support the civil disobedience campaigns of South Africa's African National Congress (ANC) against the apartheid system. Both the African and African American movements entered a new stage in that decade. The year 1955 marked a turning point for both. In June, the ANC and its allies convened the Congress of the People in Kliptown, near Johannesburg. The Freedom Charter adopted there, just before police moved in to disperse the assembly, declared that "South Africa belongs to all who live in it, black and white." Two months later, a 15-year-old from Chicago named Emmett Till was kidnapped, killed, and dumped in the Tallahatchie River in Mississippi, accused of provocative remarks to a white woman. That killing was one of the decisive catalysts for the U.S. civil rights movement of the next 10 years. Prexy Nesbitt and I were only a few years younger than Emmett Till. For both of us, there is a direct line from his death to our engagement with support for African liberation. Nesbitt was in Chicago when Till's body was brought back and viewed by thousands at an open-casket funeral. I, a white American growing up on an interracial cooperative farm in Mississippi, spent my childhood just 35 miles from where Till was killed. Our cooperative, a legacy of the Southern Tenant Farmers Union of the 1930s, served the local black community with a clinic and a cooperative store that were more successful than our limited farming operations. In the charged atmosphere of the mid-1950s, white plantation owners targeted the co-op with a boycott, threatening their black workers with expulsion if they continued to associate with it. Within a year of Till's murder, the co-op residents had dispersed, most leaving Mississippi. For both Nesbitt and me, our memories of the 1950s and our understandings of racism in the United States are linked to our later involvement with Africa. Similar links are common to many other activists we have spoken to. But diverse connections between Americans and Africans, embedded in the history of race on both sides of the Atlantic, are not unique to this period. They predate the 1950s by decades and even centuries, going back to the earliest years of the slave trade. To cite only one prominent example, in 1839 captive West Africans rebelled and took over the Spanish slave ship Amistad. Afterwards the ship was captured by a U.S. Navy ship; the Africans were charged with the murder of the captain and jailed in New Haven, Connecticut. After a long legal battle, in which they were supported by abolitionists and represented in court by former president John Quincy Adams, the Supreme Court freed the "mutineers" in 1841, and they returned to Africa. Historians are beginning to trace far earlier connections as well, such as the contacts between black American and Caribbean sailors and the black populations in Cape Town, South Africa before the nineteenth century (Atkins 1996; Linebaugh and Rediker 2000). In the nineteenth century, the complex interaction among the Americas, the Caribbean, and Africa featured influences in many different directions. In the first half of the twentieth century, the links between resistance leaders in South Africa and African Americans were particularly close, as shown most recently in David Anthony's (2005) richly textured biography of the complex figure of Max Yergan. Nonetheless, the last half of the twentieth century stands out as a distinct period. In Africa, a remarkable march to freedom produced more than 50 independent states. In the United States, organizing, protest, and legislative changes resulted in the passage of the Civil Rights Act of 1964 and the Voting Rights Act of 1965, the most important advances for African Americans since the Emancipation Proclamation. Throughout this period, there was a constant interplay between how activists in the United States understood their own country and how they made connections with others in Africa and around the world. These reciprocal connections--and in particular the influence of Africa on Americans--hardly appear in conventional historical accounts. When a journalist from Ebony magazine asked Mandela about how the American civil rights movement had influenced South Africans, Mandela replied, "You are correct, there are many similarities between us. We have learned a great deal from each other" (May 1990). While the reporter's question implied one-way influence, Mandela's tactful correction stressed that the learning process was two-way, and that the struggles on both continents shared much in common. Chapter continues on pages 12-58. Order book.